Mish's Global Economic Trend Analysis: Ukraine Needs Second Bailout, Currency Reserves Drop to Critical Level; Another IMF Visit; Where's the Love? Ukraine Needs Second Bailout, Currency Reserves Drop to Critical Level; Another IMF Visit; Where's the Love? On Wednesday I noted the arrival of carpetbaggers in Ukraine. (See Enter the Carpetbaggers: Ukraine's New Finance Minister a US Citizen, New Economy Minister from Lithuania). No carpetbagging mission is ever complete without at least one visit from the IMF. On Friday we learned that Ukraine will be blessed with a second visit from the IMF as its Foreign-Currency Reserves Dip Below $10 Billion. Ukraine’s central bank reported foreign-currency reserves at their lowest for almost a decade, raising pressure on the West to provide more financing to the country being squeezed by Russia. It also presents a dilemma for the West, which is reluctant to hand over more cash without clearer evidence that Ukraine’s newly elected government will deliver on pledges to overhaul the bureaucratic and corruption-plagued economy. Ukraine needs to pass a tight budget for next year among other overhauls to land nearly $3 billion from the International Monetary Fund, part of a $17 billion package that officials and analysts in Kiev say already needs to be expanded. “Ukraine is currently in a pretty critical condition—and desperately in need of IMF life support,” Standard Bank analyst Timothy Ash wrote in a note. Ukraine’s central bank said Friday its reserves dropped 21% to $9.97 billion in November from the previous month, after paying off some debt for natural gas deliveries owed to Russia, and servicing other debts. Reserves are now at their lowest since December 2004, when they stood at $9.71 billion. Analysts said the reserves now cover a little over one month of imports, while the IMF recommends reserves equivalent to at least three months of imports. The national bank spokeswoman said reserves were “enough to cover all current liabilities.” [Failing to add ... for a month]. Encouraged by the US, Ukrainians overthrew a Russian-leaning government. The new thugs sought closer ties to Western Europe. So, where's the European love? There isn't any. No money is coming from Germany, Italy, France or anywhere else. Worse yet, Ukraine is bogged down in a war with rebels and all of its gold mysteriously vanished. Except for the printing press, Ukraine has no money to wage war or pay soldiers. And it has no money at all to pay for oil, natural gas, or any other imports. As one might expect under the dire circumstances, Ukraine's currency, the Hryvnia, is in a state of freefall. 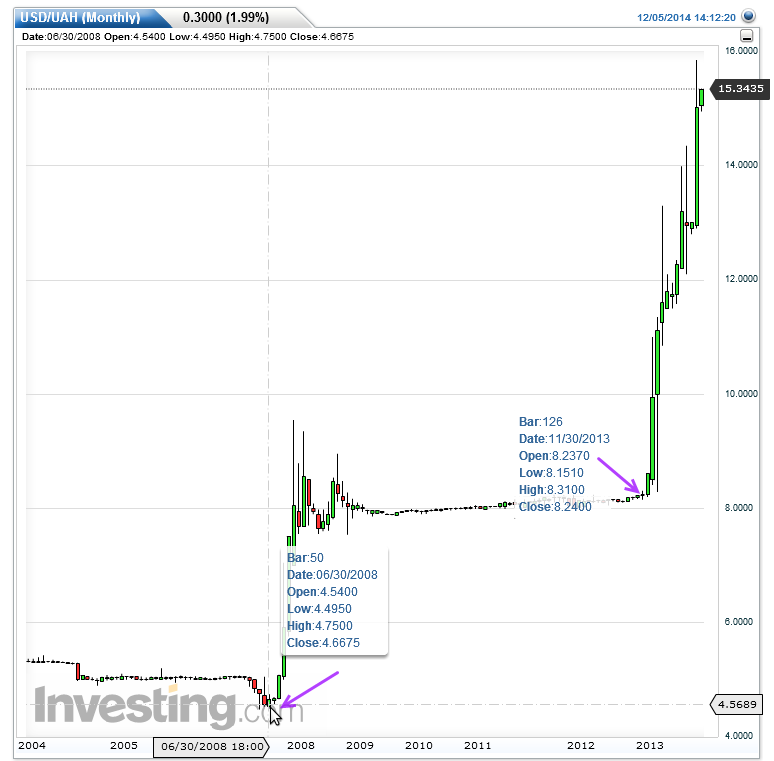 Since November 30, 2013, the Hryvnia has gone from 8.15-per-US$ to 15.34-per-US$. That's a decline of 46.87% in just over a year. 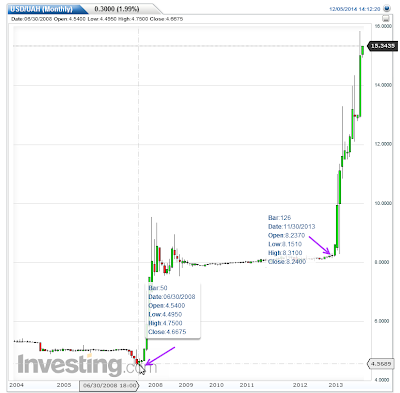 Since June 30, 2008, the Hryvnia has gone from 4.5-per-US$ to 15.34-per-US$. That's a decline of 70.66%. Were those closer ties to Western Europe worth it? If so, for whom?